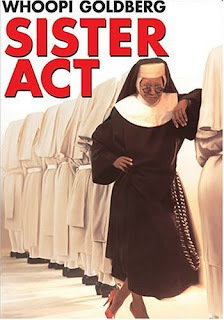 2- Joyful, Joyful (mp3): This is at the end of the movie where the group participates in the big gospel competition. Lauryn Hill is the opener for this hip-hop take on “Joyful, Joyful.” No comment regarding her spectacular vocal talents. There are other songs like “Wake up & Pay Attention” and “His Eye is on the Sparrow, (mp3)” but I think these songs are one of the best on the soundtrack. We all know that Kuwait is not as safe as it used to be. With that said, I think it should be wise and quite necessary for all women to be aware of their surroundings and the danger that lurks about. My relative’s co-worker was at Marina Crescent at ten on a quiet Friday morning. As soon as she parked, a car quickly pulled up behind her, preventing her from driving back out. A man, wearing the traditional Kuwaiti attire, hopped out of the car and for five minutes, stood behind her car, waiting for her to get out. Meanwhile, she immediately locked her car doors after calling the police. He sped away as soon as he saw the police’s obvious car. After using the ATM machine, another young woman returned to her car and plopped her cash filled bag on the passenger seat. Suddenly, a strange car stopped behind her. The driver stayed in his seat while the passenger sprinted to her still parked car, opened the passenger door and snagged her bag. The two young men took off, leaving the young woman in her mugged and startled state. Ladies, be very wary of your surroundings. These muggers work quickly and obscurely and it is very hard to pinpoint who it was or where they came from or where they are heading. No matter what time it is or where you are, always remember to lock your car doors when you plant your rear behind the wheel. Also, take a quick scan before and after you enter your car. You do not have to be a member of the CIA to have that something-is-not-right gut feeling. Use it well and be on the look out to avoid muggers or worse. I don't know how to start this post. I wrote something but it was lame. I'll just leave you with these sweet songs I picked out especially for this damned day. Have a good one. Remember this post? Well, I still wanted my Swedish Fish! 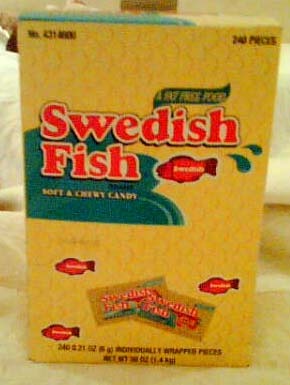 After six weeks and two cancellations thanks to the Sultan Center, my box of sweet Swedish Fish has arrived! I am currently basking in their delicious taste. They say sharing is caring but people, this time, sharing this with you - in a physical sense - would harm your being. Swedish Fish, will you marry me? Swedish Fish: Of course Erzulie, you're my biggest fan and you appreciate my gelatin taste more than any other frequent buyer. 1- It’s nice to don or adopt. 2- It’ll surely look nice on you. Hell, I’ve seen really pretty girls take on this uglifying craze and they ended up looking not so pretty. I just think it looks weird and kind of evil. I thought eyebrows were supposed to frame your eyes in a neat way, not make you look like you’re plotting your next murder. Oh, and we’re also competing with Texan beauty pageants with big hair now. I think it’s more of a nest than puffy hair; I won’t be surprised if I see little, baby birds tweeting in that voluminous chunk of processed hair. I was in the supermarket and I saw a young woman with hair rising up to building’s ceiling. Now, on many girls it’s actually nice, but doesn’t that kind of overly flamboyant hairdo belong in weddings and formal events and not be taken for a sweaty walk on the seaside? I was sitting beside a young woman while waiting to be interviewed a few days ago. After staring at the few passersby bumbling by us, we turned to each other and started to chat. The bubbly woman was telling me about how she was bored sitting at home and how she cannot wait to begin working again. I nodded and smiled but after she told me that she had just gotten out of her 40-day maternal leave from her old job, I was in shock. “She has a 40-day old baby and she’s already out looking for a job?” I wondered to myself. Now, some might say that there are many married couples that cannot afford to support a child under one salary, primarily the husband’s. I am purposefully excluding these types of cases because sometimes, one cannot help it. For instance, the wife might have an unexpected pregnancy or some scenario similar to this. And the new parents do have options on who to leave their child with i.e. grandparents, aunts, uncles, etc. What intrigues me is the amount of educated, bright, and most importantly, extremely well-off women who place their career in front of other factors in their life. I know of a woman who has two children under the age of five. She is famed for her cunningness and intelligence, especially in the field she is in. Apart from having a high paying job, both she and her husband have inherited large sums of money that guarantee even their children’s children’s future financial comfort. However, what is so sophisticated about leaving your own flesh and blood in the hands of nannies, drivers and cooks? I cannot see any sort of civility these people claim to possess when they dismiss their should-be first priority: their children. Personally, I view a parent’s physical proximity as a very important thing to have. Even if one is sitting in the living room with his/her parents in complete silence, that in itself is a luxury and it does make a difference. When I was in school in Kuwait, I remember some of my friends scurrying off to their awaiting drivers to be taken home. I used to be greeted by either my parents or siblings. I cannot even imagine coming home to an empty house while knowing that both of my parents will be arriving at six or eight in the evening. I wonder about how the next generation will turn out to be like, considering this cold-blooded, parental detachment and all.